Join us for "A Day of Hope", Benefit for Substance Recovery Programs. Blog Join us to celebrate 36 years, 4000 women overcome substance use! Join us to celebrate 36 years, 4000 women overcome substance use! 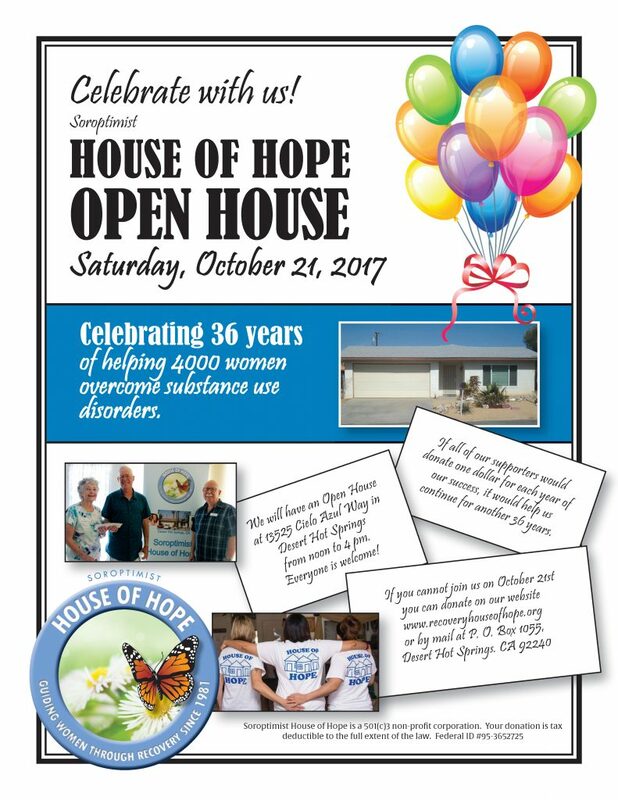 Soroptimist House of Hope Open House is celebrating 36 years of helping 4000 women overcome substance use disorders! Everyone is welcome! If all of our supporters would donate one dollar for each year of our success, it would help us continue for another 36 years. If you cannot join us on October 21, you can donate here, or by mail at P. O. Box 1055, Desert Hot Springs. CA 92240. For more information call (951) 849-9491.